NOTICE OF COPYRIGHT: All portions of our project's descriptions presented here below are the intellectual property of its two authors, George Perantoni and Valerie Perantoni (except portions giving credit to others). 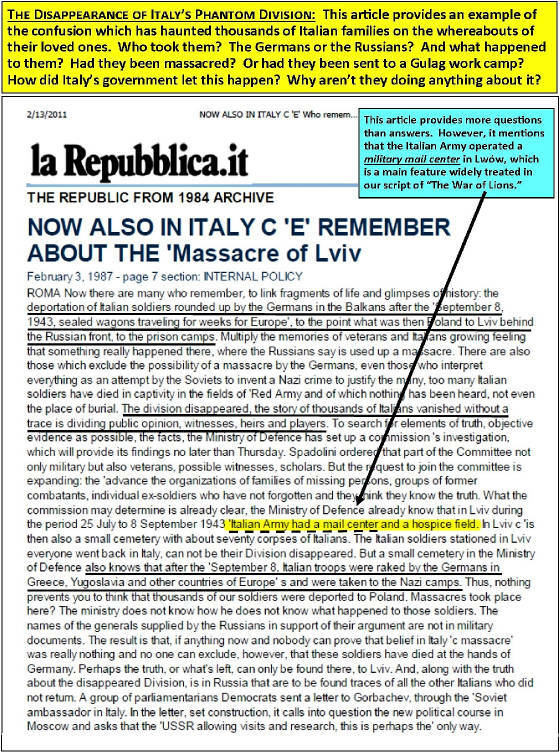 Likewise, all contents publicized by them in Kickstarter and related campaigns and all intellectual property from their 2018 revision of “The War of Lions” are exclusive copyrights of George Perantoni and Valerie Perantoni. Fascist Italy's fatal blunder with her sons. of similar leadership by madmen. THE "PHANTOM ARMY" OF LWÓW. BUT, THEY NEVER CAME HOME !! in 1943. A dishonor that had not been resolved to this day. of Fascism and the surrender of Italy's Monarchy. reasoning - arguments - and rationalizations of the matter. to declare war on her own sons! Note the blue 'question mark' which I placed in the above article. assertion that "there was no armed resistance in Lwów" !! Poland's Eastern Borderlands, their beloved Kresy. of Lwów - and there were many more! another one, more vicious than the first, came from the east! ... and he didn't let go until 1989! Likewise, the spirit of Lwów's AK Partisans didn't let go either! Today the spirit of Armia Krajowa lives ... on the internet! 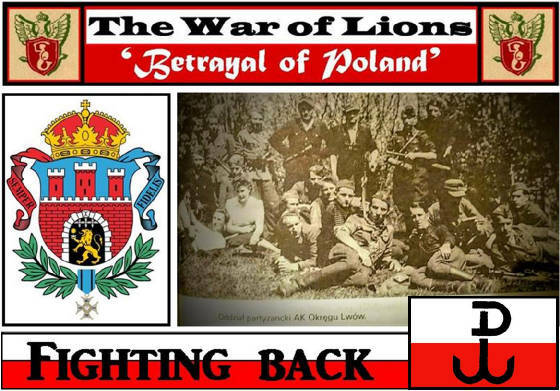 of information related to Italy's missing 'Phantom Division' of Lwów. ... in the grip of Communist Bolsheviks. during which very little information had been shared with the west. ... Italy's 'lost Division' had been attached. request an investigation, nor any authority to conduct one themselves. postponed the likelihood for an investigation in Soviet-held Lwów. of finding any traces of Italy's 'Phantom Division' in Lwów. as being one of the "Big3" who would supposedly liberate Poland. from the east, with no oversight by Anglo-America. "Only in Lwów," the King found its tune to be quite pleasant. of Lwów and keep it for the next 45 years. ... the reason for which they had been fighting. 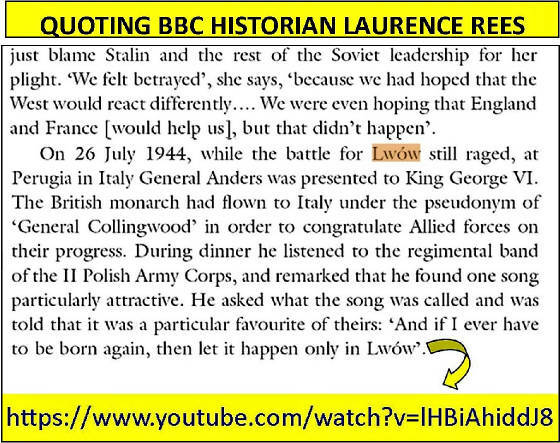 Below are two 'YouTube' links of the popular tune "Only in Lwów"
which had pleased King George VI. Both are short pleasant videos. The first is a segment from Lwów's popular comedy-film "The Tramp." and his valiant troops remembered the city. Waltz from Poland: Tylko we Lwowie - Only In Lwów! SUBJECT ARE BEING ADDED TO THE SCRIPT.